The January 2004 Mussel of the Month is Alasmidonta heterodon. 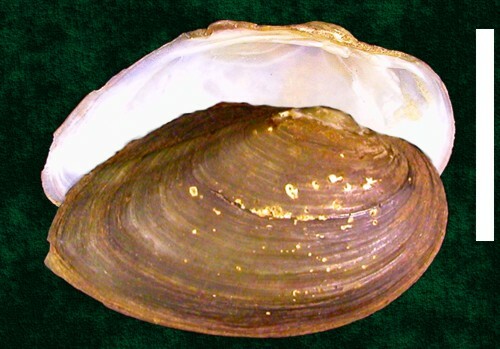 A. heterodon is one of 70 North American freshwater mussels protected by the U.S. Endangered Species Act. Alasmidonta heterdon (known to those concerned with common names as the dwarf wedgemussel) was once know from at least 70 localities along the eastern coast of North America, from Canada to North Carolina. According to the Recovery Plan (Moser, 1993), it is now limited a few localities in only eight river drainages. There are no longer extant populations in Philadelphia, the locality from which the above figured specimen came. Moser, G.A. 1993. Dwarf Wedge Mussel (Alasmidonta heterodon) Recovery Plan. U.S. Fish and Wildlife Service, Region Five, Hadley, MA. 43 pp. + appendix. Available as a pdf from the USFWS.